The authoritative Saudi daily Asharq Alawsat says today the Syrian opposition umbrella organization, known as the Syrian National Coalition, is seeking to push back the Geneva-2 peace conference for Syria slated to be held in the Swiss resort of Montreux on January 22. Q.: Mr. Fabius, in three days’ time you will host an important meeting on Syria. You said just now that you have discussed this matter with your guests. At a time when the Syrian opposition is tearing itself apart -- they haven’t yet managed to accept or turn down the invitation to attend the Geneva-2 conference -- what can we expect from a conference in which the opposition may not participate? Regarding Syria, the day before yesterday, I received the invitation from Mr. Ban Ki-moon, UN Secretary-General, to the Geneva conference on January 22 which should take place as follows: On the first day, a meeting will take place in Montreux where we will set out our positions. Then on January 24, there will be a meeting between the Syrian delegations, in the presence of Mr. Brahimi. Obviously, we support the holding of the Geneva-2 meeting, to the extent that we have always maintained from the outset that the solution be a political one. I would also like to say that if people had listened to France more carefully from the outset, then we probably wouldn’t be in the absolutely tragic situation that we’re in now. I remember very clearly – it was one of the first times that I received many of my foreign colleagues, just after we took office – the major conference known as the Friends of Syria conference. At the time we said that Mr. Bashar al-Assad, who UN Secretary-General Ban Ki-moon described as having committed “crimes against humanity,” could not have a role in the future of Syria’s people. The vision of the future should be built around the moderate opposition. At the time, in July 2012, there was no Iranian or Hezbollah presence, and there were no terrorist movements. A specific action would have been enough to ensure that developments proceeded as desired but we weren’t heeded. The U.S. elections took place, there was dissent between different groups, and now we find ourselves with an absolutely tragic situation. Thousands of people die every month; there are appalling atrocities. The number of deaths has now exceeded 130,000. There are millions of displaced persons, with tragic consequences, not just for Syria, a tormented country, but also for Jordan, Lebanon, Turkey and Iraq. We need a political solution to address this. In order to find this political solution, we have to engage in discussions – hence Geneva. The letter that Mr. Ban Ki-moon sent us, which is very well written, states that the goal of the Geneva meeting is to create a transitional government with full executive powers, through discussions between the parties. We don’t support Mr. Bashar al-Assad, who is guilty of crimes against humanity, or the terrorists. We have to find a solution through dialogue. It’s true that the situation of our moderate opposition coalition friends isn’t easy. They have to fight on two fronts: on the one hand, there’s Mr. Bashar al-Assad, supported by the Iranians and the Russians; and on the other hand, the terrorist movements. That’s why we’re going to have a meeting on Sunday involving the 11 countries that make up the so-called “Core Group” in the presence of Mr. Ahmad al-Jarba who has just been re-elected as president of the moderate opposition and we will discuss the situation. The moderate opposition will meet again on January 17, following our meeting in Paris. This is where we are. 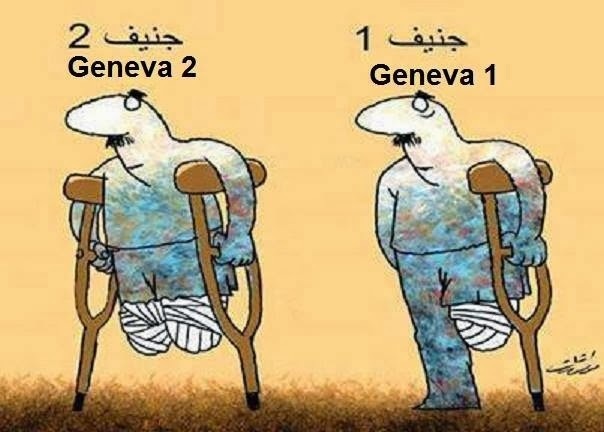 We believe Geneva-2 -- provided its mandate is fulfilled -- is necessary. We call on all parties to make an effort to participate in the conference, but in accordance with the mandate. If Geneva-2 takes place – as we hope it will – there will be a second difficulty, namely the need to achieve concrete results. If we want a political solution, we have to talk to each other. At the same time – and this is a request that I reiterate to the international community – we must put an end to the atrocities, to the terrible bombing that’s taking place and address the humanitarian needs. The opposition is right to demand that, in parallel to Geneva-2, humanitarian corridors be established and the bombing cease.